I might have mentioned this before, but I’m a big fan of trout. Do you love trout? If not, in my opinion, you should reconsider. That is unless you just absolutely, positively hate fish, then you should probably disregard this post. Just kidding. You shouldn’t, I’ll try to change your mind. Trout is pretty versatile, you can dress it up however you like and it always tastes delicious. Something that I find that happens during the week is that you’re running around and there isn’t enough time to put together a full, healthy meal. Well here’s your answer! 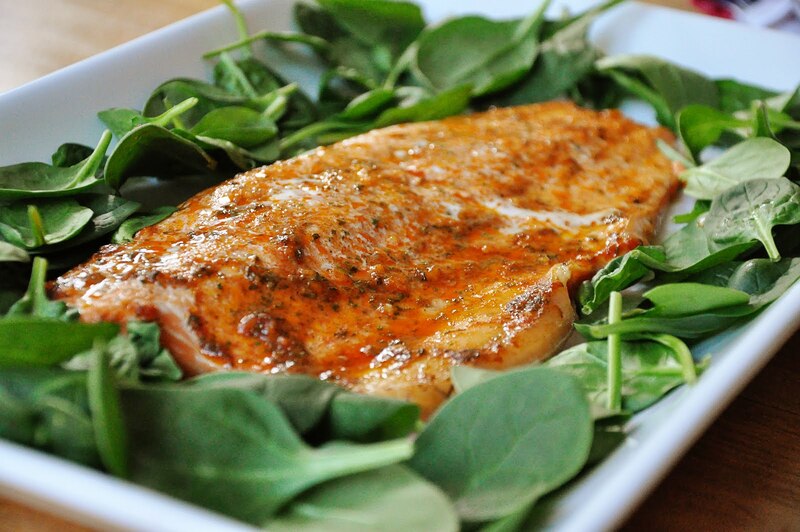 This trout is so simple, mix a few ingredients together and bake in the oven, serve with a side salad and some brown rice and you’re good to go! One of my favourite ways to eat trout is covered with aromatic herbs with the heat of chili flakes, such as in my Terrific Trout recipe! This version of trout is completely different than my previous recipe, yet it is still very tasty! Preheat oven to 325F degrees. Grease a baking dish with a little olive oil. Next, in a bowl, whisk together all the ingredients and brush over trout. Place trout in the dish and bake for 18-20 minutes. This is the perfect recipe to cook up some scrumptious trout for dinner tonight! I love trout! This looks great. Great recipe for fish! This is a tangy sauce that adds great flavour! Nice presentation. This looks wonderful! I'm always looking for new ways to add flavor to fish. Yum! I love fish and seafood of all kinds, but I don't cook with trout a lot. I should! This recipe looks wonderful.